I just want to make it short by not telling stories. For detail stories reach to reference article. 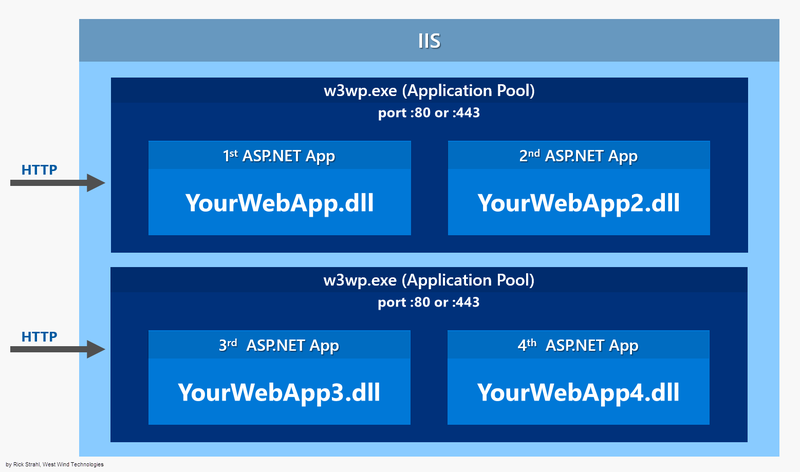 In a classic ASP.NET application everything is hosted inside of an IIS Worker Process (w3wp.exe) which is the IIS Application Pool. The AppPool hosts your ASP.NET application and your application is instantiated by the built-in ASP.NET hosting features in IIS. 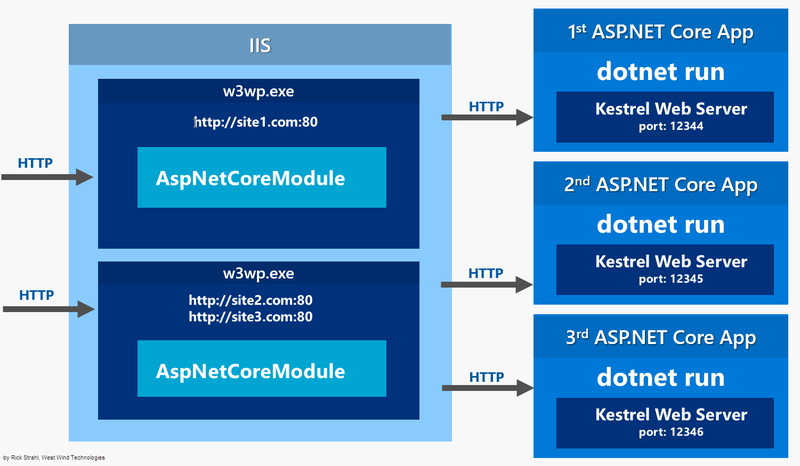 With the ASP.NET core, the application is NOT hosted inside of an IIS worker process but rather runs as a separate process (like a Console application) that runs its own Web server using the Kestrel component. It’s fast and functional in getting network requests into your application, but it’s ‘just’ a raw Web server. It does not include Web management services as a full-featured server like IIS and NGNIX does. The AspNetCoreModule’s job is to ensure that your application gets loaded when the first request comes in and that the process stays loaded if for some reason the application crashes. Once running, incoming Http requests are handled by this module and then routed to your ASP.NET Core application. 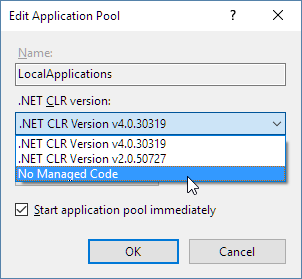 While the IIS Site/Virtual still needs an IIS Application Pool to run in, the Application Pool should be set to use No Managed Code. Since the App Pool acts merely as a proxy to forward requests, there’s no need to have it instantiate a .NET runtime. If the above config does not work try with the following config which you will be getting when you published in the local system folder. 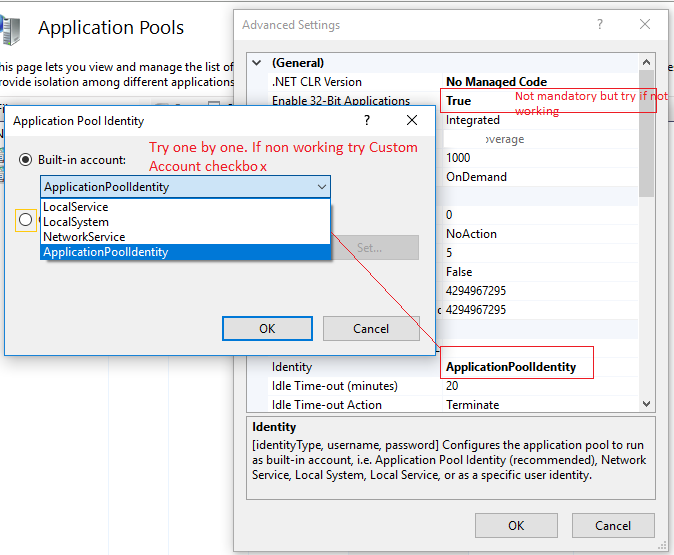 You might also have to tweak the IIS App Pool Identity to something other than the default ApplicationPoolIdentity in order to ensure that your application has access to resources it needs to run. Try starting with NETWORKSERVICE and then move to a Custom Account that matches the actual rights required by the application. Change the web.config to point to the right module.